Americans are increasingly sedentary and suburbanized—a far cry from their hardy, pioneering forebears who settled wild lands. For the rest of us, though, Trellisys.net offers SAS Survival Guide, a $7 app packed with information and features that will be fun even for urban couch-dwellers. I Will Survive: An electronic version of John ‘Lefty’ Wiseman’s book is at the center of SAS Survival Guide. But you’ll also find quizzes, videos, a compass, and way to tap out messages in Morse code, among other features. 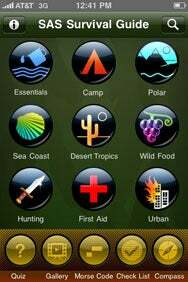 The core of the app is an electronic version of the best-selling SAS Survival Guide Handbook by John “Lofty” Wiseman, a veteran of the British Special Air Services. Wiseman offers advice on how to camp, survive and thrive in polar, desert and other challenging environments. Despite all the nifty features, though, the SAS Survival Guide might be more for Jack London wannabes than for actual adventurers. Why? Because there’s one disaster it doesn’t prepare you for—getting lost in the wilderness without any way to recharge your iPhone battery.